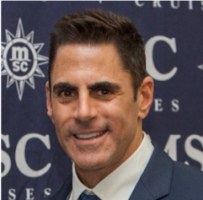 Ken Muskat, executive vice president and chief operating officer for MSC Cruises (USA), is a well-respected cruise industry expert with more than 20 years’ experience in the fast-expanding industry. In his current role, Muskat is focused on the overall growth and positioning of MSC Cruises in the U.S. market and directly responsible for all key travel trade and consumer-facing functions including, sales, hotel operations, contact center, revenue management, marketing and communications. Muskat returned to MSC Cruises in February 2019, after serving as CEO of China-based SkySea Cruise line for two years. Prior to SkySea, Muskat held various senior leadership roles across a broad range of functions with MSC Cruises and Royal Caribbean International. Muskat also served as Chairman of the CLIA Trade Relations Committee, working side by side his colleagues in the industry to develop programs to further train travel agents and establish the role they play in the industry’s success. Muskat graduated from the University of Hartford with a Bachelor’s Degree in Communications and Advertising. Born and raised in Miami, Fla., Muskat enjoys extensive travels and an active lifestyle full of many friends and an amazing family. He can be followed on Twitter @KenMuskat.